Value: Value to lord in 1086 £32.5. Value to lord c. 1070 £18. Households: 42 villagers. 30 smallholders. 6 slaves. 6 Cottagers. Ploughland: 30 ploughlands (land for). 7.5 lord’s plough teams. 22 men’s plough teams. Other resources: 3.0 lord’s lands. Meadow 95 acres. Pasture 6 x 2 & 20 acres mixed measures. Woodland 1.5 leagues x 2 furlongs & 9 x 1.5 furlongs mixed measures. 4 mills, value 1.03. Livestock in 1086: 2 cobs. 12 cattle. 20 pigs. 123 sheep. 23 goats. Lords in 1066: Glastonbury St Mary, abbey of; Spirtes the priest; thane, one; thanes, two. Overlord in 1066: Glastonbury St Mary, abbey of. Lords in 1086: Ralph Crooked Hands; Count Robert of Mortain; Everard; Nigel the doctor; Serlo of Burcy; Glastonbury St Mary, abbey of; Aelfric son of Alwaker. Tenants-in-chief in 1086: Glastonbury St Mary, abbey of; Count Robert of Mortain. 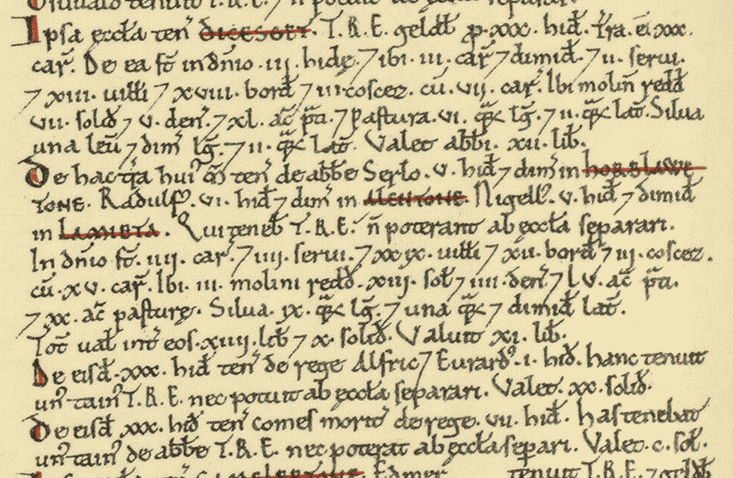 The information on this page is reproduced with thanks from the Lamyatt page of Open Domesday, The first free online copy of Domesday Book.